A new book by Carnegie Mellon University’s Christopher N. Warren discloses how a Bush Administration lawyer misinterpreted cultural history to justify War on Terror activities such as waterboarding and secret prisons. In researching “Literature and the Law of Nations, 1580-1680,” Warren discovered writings on sixteenth-century international law by the future Deputy Assistant U.S. Attorney General in the Office of Legal Counsel John Yoo, who is best known as an author of the so-called “torture memos.” Yoo’s commentaries, published while Yoo was a law professor at University of California, Berkeley in 1997, argued that international law did not apply to non-state combatants. The Bush Administration’s controversial “torture memos” of early 2002 would argue the same. Warren, assistant professor of English in the Dietrich College of Humanities and Social Sciences, says that the subject of Yoo’s analysis, an Elizabethan jurist named Alberico Gentili who is sometimes called the “father of international law,” is just one of the sixteenth- and seventeenth-century thinkers who still influence contemporary international affairs. Published by Oxford University Press, “Literature and the Law of Nations” shows that international law today owes many of its most basic ideas to early modern culture. However, habitually divorcing legal ideas from cultural history, Warren contends, has had negative consequences. Yoo’s study of early modern international law, for instance, should have led Yoo in very different directions. Using evidence from legal archives, literature, and drama, Warren shows that international law regularly applied to individuals operating outside official state roles. 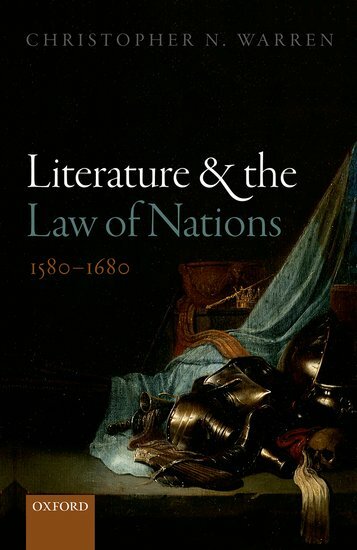 Warren wrote “Literature and the Law of Nations” because writers like William Shakespeare, Francis Bacon and John Milton had wrongly been excluded from the usual stories about international law. He traces the origins of international law to early modern poets, dramatists and translators and shows how their works continue to influence modern understandings of international law. Literary and legal scholars, he proposes, should resist tendentious but politically consequential assumptions about whether international law is "real" law. “Broad and expansive in its thinking about the power of humanist learning, especially literary scholarship, while at the same time, thoroughly fluent in the historical details and cultural nuances of the early modern period, Warren’s book makes a dazzling case for reinvigorating historicist scholarship through the study of literary genre and form,” said Rachel Trubowitz, professor of English at the University of New Hampshire. From questions of diplomatic immunity in Milton’s “Paradise Lost,” to international commercial law in Shakespeare’s comedies, Warren demonstrates in “Literature and the Law of Nations” that literary writers were giving as much to international law as they were taking from contemporary controversies. Read more about “Literature and the Law of Nations."